More than 1.6 million people were arrested for drug offenses in the US last year, according to the FBI’s Uniform Crime Report 2010, and more than half of them were for marijuana. 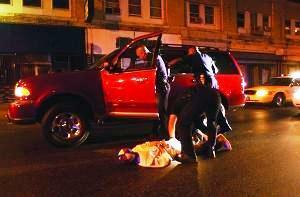 That’s a drug arrest every 19 seconds, 24 hours a day, every day last year. The numbers suggest that despite “no more war on drugs” rhetoric emanating from Washington, the drug war juggernaut is rolling along on cruise control. Marijuana arrests last year stood at 853,838, down very slightly from 2009’s 858,408. But for the second year in a row, pot busts accounted for more arrests than all other drugs combined, constituting 52% of all drug arrests in 2010. Nearly eight million people have been arrested on pot charges since 2000. The stabilization of drug arrests at record high levels comes as the FBI reports all other categories of crime are dropping. Violent crime was down overall, with murder decreasing by 4.2% and robberies by 10.0%, while property crime was also down overall, with burglary and larceny declining by more than 2% and motor vehicle theft and arson down by more than 7%. Drug arrests were the single largest category of arrests, accounting for more than 10% of all arrests in the country. They were followed by drunk driving arrests (1.41 million) and larceny arrests (1.27 million). More than three times as many people were arrested for drugs than for all violent crimes combined (552,000) and nearly as many as for all property crimes combined (1.643 million). African-Americans continue to be arrested for drug offenses in disproportionate numbers. Blacks accounted for 31.8% of all drug arrests last year, while according to the US Census Bureau, they constitute only 12.6% of the national population. The high drug arrest numbers were grist for the mill for drug war critics. While national drug reform groups had harsh words for the policies leading to the overall drug arrest figures, marijuana reformers were equally critical when it came to the herb and the arrests it generates. More than a decade of drug reform efforts have managed to slow what once seemed to be endless annual increases in drug arrests in the US, but stabilizing at around 1.6 million drug busts a year is not victory, only the first step in putting the brakes on the drug war juggernaut. Now, it’s time to start concentrating on bringing it to a screeching halt.